Nerve repair is one of the most common microsurgical procedures. 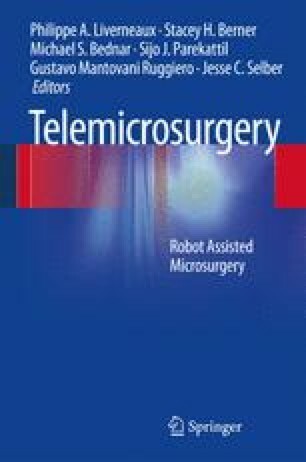 The efficacy on the reconstruction relies on the best anatomic matching on the nerve stumps; thus the improvements on vision, dexterity and ergonomy to the surgeon using the robotic telemanipulator may bring important benefit on this kind of surgery. Brachial plexus repair is a challenge for any microsurgeon. Those injuries may affect adults in high-energy trauma or newborns due traumatic delivery. The traditional treatment of those lesions depends on serial clinical evaluations to define the severity of the injury and the surgical indication. This always brings 2 or 3 months of delay on the surgery, and the scar formed is an important obstacle to reach the optimal surgical result. The potential benefits on the use of robotic telemanipulation on brachial plexus may include a minimal invasive approach. This new possibility may radically change the traditional handling of those patients, since a less risky and aggressive surgery could be performed on the acute presentation of the injury. This topic and other research on robotics use peripheral nerves, and brachial plexus injuries are stressed on this chapter.